To enlarge an image, click the image. To leave a comment, click the "comments" link below the image. 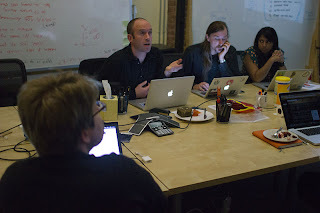 Typical War room shot, found on line. A lot of folks think there is a certain amount of glamour in my job. And, while I do travel a lot and live in hotels and get to dine in some pretty nice restaurants-- there's not much that's elegant about 4AM wakeup calls to make 6:30 flights, living out of a suitcase, working 10-12 hour days and, depending on the season and the location of your client, traveling each week from 30 degree weather to 80 degree weather (or vice versa) which ensures that you will be inappropriately dressed at one end or the other. But possibly the least elegant aspect of my job has nothing whatsoever to do with travel -- it has to do with what's awaiting you at your destination-- specifically, hotel cubes, war rooms and enclaves. For those of you who have never done the Consulting Conga, forget everything you have seen on Showtime's House of Lies. Other than on Day 1, there is rarely anyone from the client to welcome you and get you situated. They (rightly) figure that you do this for a living and can find your way around on your own. With big companies, after the initial security briefing, on projects lasting longer than a week, you will eventually be abandoned to the nether world of the "transient worker." Most large organizations have a few empty cubicles (usually in terrible locations and with zero amenities, because if they were great cubes, someone permanent would have claimed them by now) that are used for visitors or consultants or employees temporarily on loan from other facilities. In theory, this makes a lot of sense. In practice...it sometimes would be easier to work from your hotel room. Why? Typically you have no phone, no printer, sometimes no wired network connection, no place to store anything or stash your bag when you leave the desk, and you are almost required to haul around one of those rolling laptop cases with all of the technology and supplies it takes to do your job. Depending on the nature of your work and the cost of your laptop, you are probably carrying around a laptop lock and will be in search of some way to secure your hardware when you need to leave the desk. Which leads me to Enclaves. In many large companies, they realize that hotel cubes and war rooms are not the optimal locations for taking/making telephone calls or conducting confidential 1 on 1 conversations. Hence the rise of the enclave-- this is a phone booth or closet-sized space with a telephone, a chair or 2, and very little else. Oxygen and air circulation is often optional. Illumination sufficient to read a standard document in 10 point type is considered a big plus. The idea is that if it becomes too comfortable in there, people would commandeer them as mini-offices, so creature comforts are minimized. In fact, in temperate climates and seasons, I have been known to take calls from my rental car instead. More privacy, better climate control, more comfortable seat and lighting, and about the same level of cell phone reception. On more than one project during my career, there is an even lower rung-- the conference table in an out of the way hallway, or, god forbid, a temporary trailer in the parking lot. I spent 10 months working 50 hours a week in a folding chair, about half a mile from the closest restroom. The chair was too high, the table too low, and neither was adjustable. These accommodations were designed for a person about five-foot-five. I am 5'9" in my bare feet (more than 6 feet tall in heels) and thought I was going to need surgery for a compressed disk by the end of that one. So the next time you are boarding a plane and you see the obviously seasoned business traveler seated in first class, realize that this is possibly the most personal space they have had all week. :-) That extra 6 inches of legroom is more precious than rubies.